For the first time in years, I was leading a Sierra Club trip. Offered by the Desert Peaks Section, Angeles Chapter, I eagerly sought an assistant leader and found one in Bill, the DPS Activities Chair. I scheduled three peaks over the Thanksgiving holiday weekend--Pinto, Eagle #1 (5,350'), and Martinez (6,560+') Mountains. Woe came to me, as the weather turned out to be windy and cold. Driving to meet the group, I made a quick stop at the Cholla Gardens for a photo of the peak. A good-sized group met me at the roadhead, Friday morning, in Joshua Tree National Park. They served as welcome to my introduction to the DPS leader pool. I planned to just go by the standard route in the DPS Road and Peaks Guide, which may have disappointed some. Some veteran climbers may have wished to work on a new route, for the Pathfinder award. There is a use trail, and despite the alternate route showings from a map, I chose to take this easy way up. We began hiking at a good hour, and I beelined to the ridge where the use trail was quickly found. One hiker hadn't brought warm clothes, and had to turn back. The rest of us were clad in parkas and jackets. The heavy wind aggravated the chill factor. The night before, in Barstow, strong winds swept through the town, making a TV news item. The use trail followed the guide's map route fairly straightforwardly. We summited by about lunch. There was no place to get out of the wind. What could I do? I took my usual summit view photos, and then, the group was anzy to descend. I retraced my route down the use trail, and took breaks at several points. The days were now short, so we hurried along. I passed by the small dunes system at the base of the mountain. Near there, we saw some coyote melons, a bulbous desert plant which I had never seen before. Back to the cars, we had to decide on where to car camp. The assistant, Bill, knew of a place nearby, but with several miles of driving on dirt road. I told everyone that I was going to Chiriaco Summit, on I-10 to the south, for food, and camping lower. They all chose to go with Bill, and camp high, and in the wind. After setting the meeting place and time for the next peak, Eagle Mountain #1, I drove off, all on paved road. I had a simple restaurant meal. It was a long night to spend alone. Saturday, the 30th, we reconvened at the campground parking lot roadhead for Eagle Mountain #1. It was still windy and cold. I took what persons still game despite the weather. We hiked along the base of the range, on a closed-off dirt track. As I found, and began, to hike up the correct approach canyon, the assistant complained of feeling ill. Quickly, I recruited another assistant, and signed Bill off. We continued up canyon, but the new assist was very slow. I must have remarked about that, and she also chose to turn around. I had only minutes to make up my mind. No one else chose to volunteer, so I was forced to cancel the trip and turn back. The Angeles Chapter rules require two leaders--a forward and a sweep. I signed off the few that chose to go for the top. Hurrying after the assist, I sought to assure that there wouldn't be an unfortunate injury on the rough terrain. We two hiked back to the campground parking. I waited for the sign-offs to return. They did, successfully. This was enough for everyone. My third planned peak couldn't be led without an assistant leader. It would have been a long climb, with probable nighttime travel required. I explained the situation to the group, of which most everyone already was very cognizant. I blamed this trip's partial failure on the unlucky weather. Normally, it is very temperate in the low desert this time of year. I was to return, and gratefully climb Eagle Mountain #1 in October, 1997. Thanks to a DPS List Finisher climb and party! 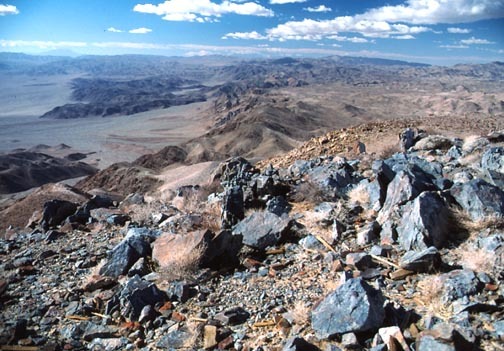 Pinto Mountain was listed as 9 miles with 2,400 feet gain, round trip. I hiked some 5 miles round trip on Eagle #1.